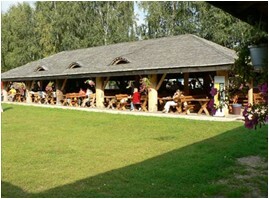 Wiecha Inn located 30 kilometers from Warsaw was chosen as a place for picnic. The whole settlement covers the area of 18 hectares with a replica of typical Polish inn in the middle of it. Rustical interior of this building has been designed as a typical village inn from the Mazowsze Region. In front of the inn there are wooden shelters that can seat up to 700 people. The most typical dishes of the traditional Polish cuisine will be served by waiters dressed in regional costumes. Guests will be welcomed by a folk band in a very traditional Polish way: with bread and salt. During the meal a unique show of old Polish art of fencing may be performed for the guests.